GAINESVILLE, Fla. – UF MBA has again been named a top program on the Financial Times’ “Top 20 Online MBA Rankings” list released on Monday. 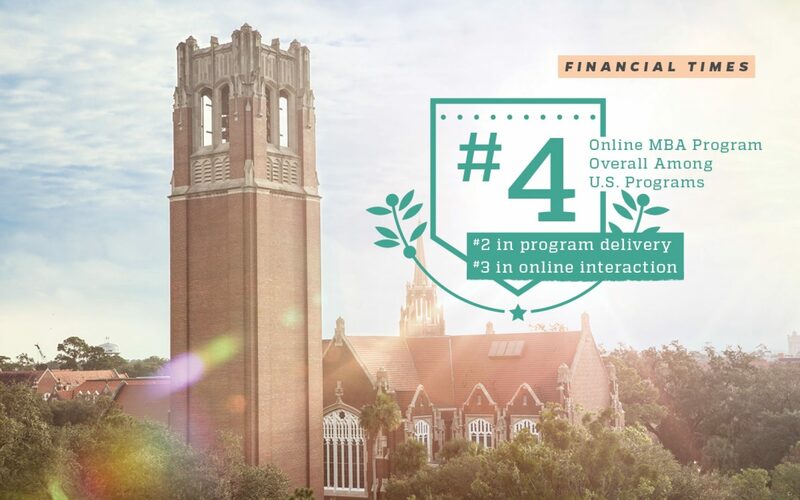 The UF MBA Online program was ranked No. 2 for program delivery and No. 3 for online interaction. The Financial Times determines program delivery rankings based on alumni ratings of online delivery of live teaching sessions, other teaching materials and online exams. Similarly, online interaction rankings are determined by alumni ratings of interaction between students, teamwork and availability of faculty. Alumni also reported strong salary numbers, allowing UF MBA to jump to the No. 7 position in the salary increase category, which measures the percentage increase in alumni salary in the past three years, starting with alumni salary upon graduation to current salary. Overall, UF MBA remained in the top 5 among U.S. programs, positioned in the No. 4 spot. UF MBA also ranked in the top 10 among all programs worldwide, landing in the No. 7 position. UF MBA offers three online programs – a new 24-month option that does not require a single campus visit, a 27-month option for any undergraduate major and a 16-month accelerated option for those who have had an undergraduate degree in business and graduates within the last seven years. The latter two options also provide a flexible format that only requires students to visit campus only once every four months, allowing minimal disruption to their careers while building an in-person network. Visit the UF MBA Online Program website to learn more about the program and its options. UF MBA was also recently recognized as the No. 1 program in value for money and as the program with the highest salary percentage increase by the Financial Times on its “Global MBA Ranking 2018.” Read more about the UF MBA Full-Time program rankings.